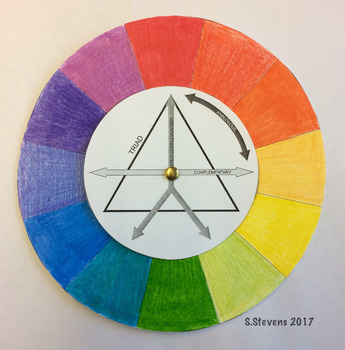 This short activity has been designed to give students a colour wheel (12 colours) that spins, allowing students to check complementary colours, split complementary colours, triads, and analogous grouping. Canadian/British spelling of COLOUR - one with the colour words visible after putting the two discs together and one where the colour words would be hidden. USA spelling of COLOUR - one with the color words visible after putting the two discs together and one where the colour words would be hidden. 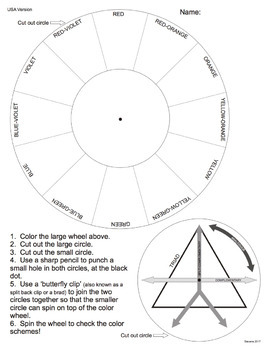 You do need split-back clips (also known as butterfly clips, or brads) to join the two discs, so that they can spin. 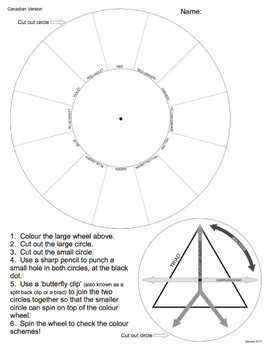 Print out on card-stock (cover paper) for a more durable spinning reference wheel.